Pennsylvania health systems UPMC and PinnacleHealth System announced Tuesday they have agreed to affiliate. PinnacleHealth, based in Harrisburg, also said it will acquire four Pennsylvania hospitals and medical centers from Community Health Systems in a separate transaction. No financial terms were disclosed for either deal. PinnacleHealth said the affiliation with UPMC, which owns more than 25 hospitals and a not-for-profit health plan, would allow it to expand its healthcare services and advance quality initiatives while providing more health insurance options for patients. The three-hospital system said it has been exploring “collaborative relationship” with other providers. 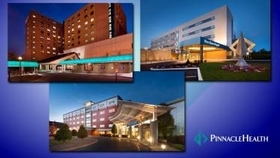 In October, PinnacleHealth abandoned its proposed merger with Penn State Hershey (Pa.) Medical Center after the 3rd U.S. Circuit Court of Appeals reversed a lower court ruling in favor of the merging health systems. UPMC recorded operating revenue of $13 billion in 2016, while Pinnacle's total revenue in fiscal 2015 was $1.07 billion, according to the Federal Trade Commission. Community Health Systems is negotiating to sell 25 of its 158 hospitals and other assets with the hope of raising about $1.8 billion in net proceeds from those efforts.